392 pages, hardcover, 9-5/8 x 11-5/8"
Enthronement scene, detail; opaque pigment, ink, and gold on paper; c.1470-90, Tabriz(? ), Iran. Topkapi Saray Museum, Istanbul. This magnificent book is the catalog to a spectacular exhibition that took place at the Royal Academy in London in 2005. 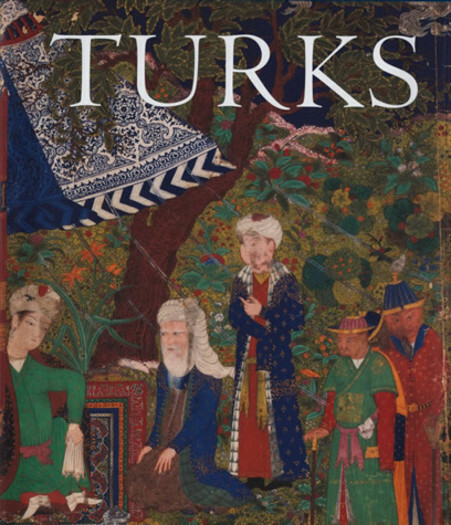 The artistic and cultural riches of the Turks are presented in a comprehensive manner. Essays by leading scholars trace the history and cultural development of the Turks. Paintings, sculpture, textiles, metalwork, and ceramics show the artistic influences absorbed by the Turks from their earliest nomadic wanderings up to the glories produced during the reign of Suleyman the Magnificent. The history of the Turks is long and diverse. This book takes the reader on a breathtaking journey from China in the east to the Balkans in the west. Turkic groups adapted to the cultures the encountered, including the Chinese, Mongol, Arab, and Persian, and to religions such as Buddhism, Islam, and shamanism. Various chapters deal with the early Turks, the Seljuks of Iran and Anatolia, the mysterious art of Muhammad Siyah Qalam (known as Muhammad of the Black Pen), the Timurids and Turkmen of Iran and Central Asia, and the Ottoman sultans. There is an emphasis on the period between the reign of Mehmed II, who brought an end to the Byzantine empire in 1453, and that of Suleyman the Magnificent. Illustrated with more than 370 works of art drawn principally from the celebrated collections of the Topkapi Saray Museum and the Museum of Turkish and Islamic Art, both in Istanbul, as well as from collections in Europe, Russia, and the United States, this book is a landmark publication and essential reading for anyone interested in the turbulent and vivid history of the Turks. Filiz Cagman is Director of the Topkapi Saray Museum in Istanbul. Nazan Olcer is Director of the Sakip Sabanci Museum in Istanbul. David Roxburgh is Professor of the History of Art and Architecture at Harvard University.